The dining room of One Fifth from James Beard award-winning chef Chris Shepherd. One Fifth, the highly anticipated second restaurant from James Beard award-winning chef Chris Shepherd of Underbelly, is now accepting reservations. 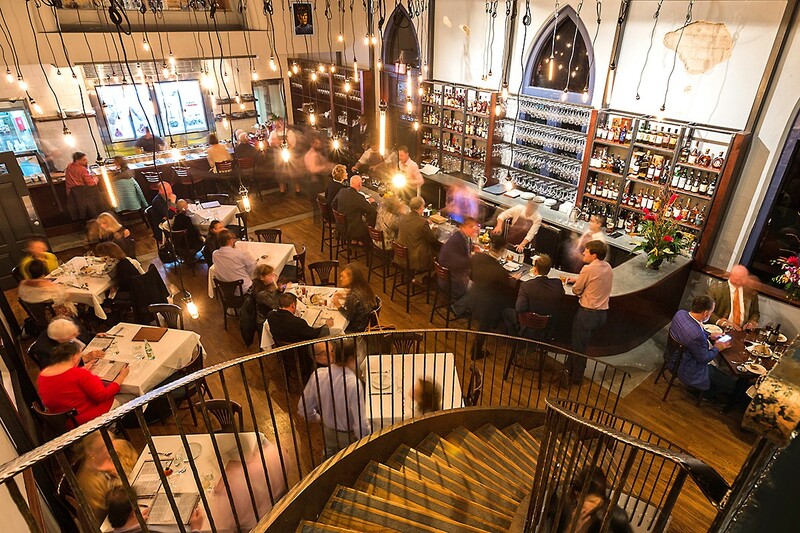 It officially opens to the public on Thursday, January 25 and is located at 1658 Westheimer in the former cathedral that used to house Mark’s American Cuisine. For its debut, One Fifth is a steakhouse (aka “One Fifth Steak”) under chef de cuisine Nick Fine, but a peek at the menu reveals that it’s not an ordinary one. There are surprises in store for diners by way of silky Chicken Liver Pate accented with strawberry black pepper preserves (with equally worthy crusty bread served alongside), Wood Roasted Lamb Neck well-seasoned with olives, tomatoes, shallots and herbs and a 10-ounce Sirloin Flap sourced from Texas beef purveyor 44 Farms. If those cuts sound esoteric, it’s because Shepherd isn’t throwing his commitment to sustainability out the window just because One Fifth is currently a steakhouse. Diners might not realize that the lust for prime cuts (ribeyes, New York strips and the like) can result in the waste of meat that is delicious when properly prepared. That said, there are still more familiar cuts on the menu, including two different ribeyes and a hefty 36-ounce Porterhouse that can probably feed the table (unless it’s full of linebackers, which is a distinct possibility at One Fifth). There are several beautiful salads that feature fresh produce as well, including carrots served roasted, shaved and pureéd, all on the same plate. When September 1 rolls around this year, One Fifth will reemerge as One Fifth Romance Languages (think French, Italian and Spanish fare). On the same date in 2018, One Fifth Fish will be revealed. The final two concepts have not yet been announced. One Fifth’s hours are from 5 to 11 p.m. every night. To make reservations, visit this web site link.